This is a large piece of work, based in an artists water colour box. The title, ‘Pieces of Eight’ refers to the fact that I have six children, so there were eight in our family. The work is read from the top right (round greenish box) anti-clockwise in a spiral ending with the column of thin sheets of paper (hand made from my garden). Then the left side is read starting from the top right, again going anti-clockwise in a spiral (but only in the top half) – finally the big book at the bottom is taken out and unfolded. The top green boxes are: 'dad' - 'the boy' - 'girly' and 'mum' - my brother and I were never called by our names. 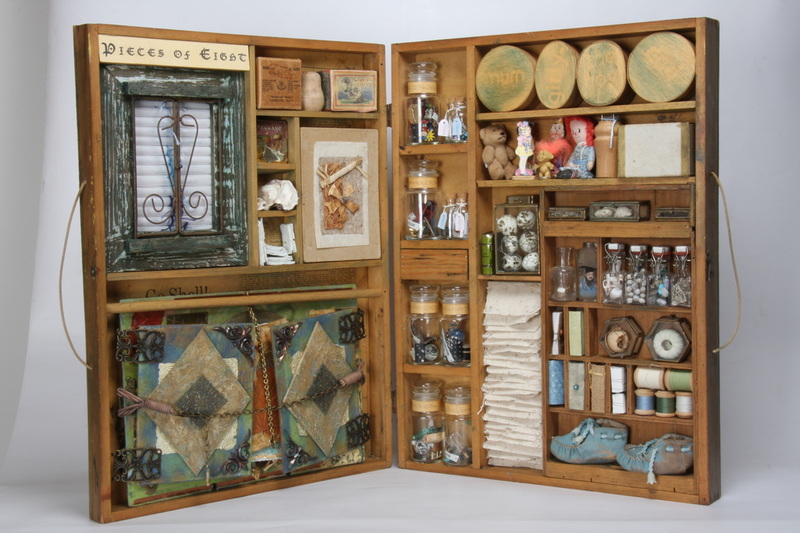 Inside each box are eight things that either belonged to, or remind me of that person - the images at the bottom of this page show the contents of the 'girly' box (mine). The six large bottles on the left are my six children, again each of the bottles has eight items in it - and the four smaller ones are my grandchildren. 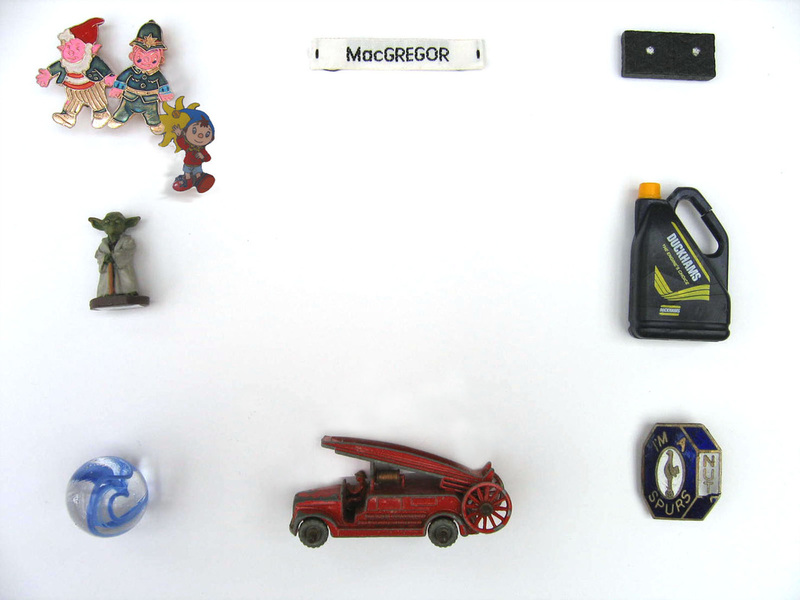 The contents of the 'JRM' bottle are shown in the last image on this page, Noddy badges from favourite childhood, Yoda because he was born in the Star Wars era books, a fire engine because he is a fire fighter, a spurs badge, an oil bottle because he done an apprenticeship in mechanics - each bottle has a marble, a school name tag and a domino, JRM has the double one because he was my first born - APM has a double two because she was the second to be born - NRM a double three - RPM a double four - CRM and double five and FMLM has the double six! 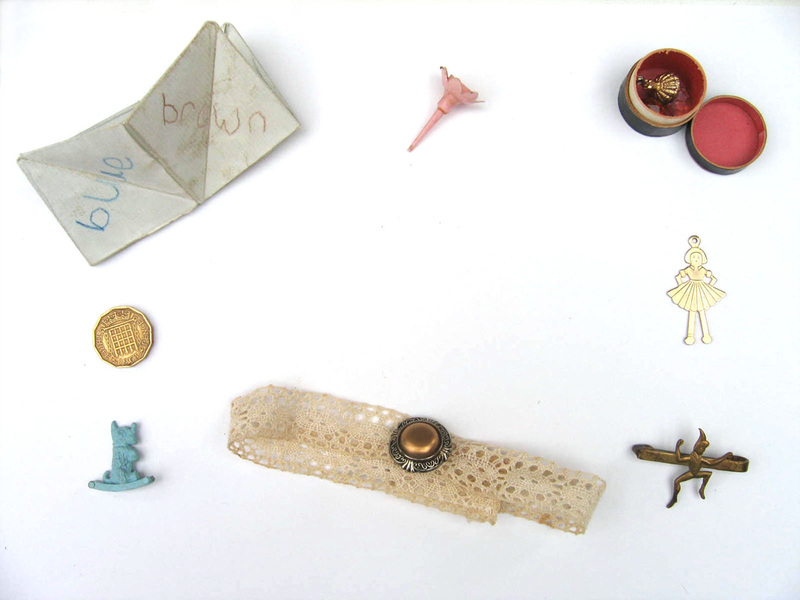 There are tiny leather baby bootees, cotton reals, bottles and boxes of things I have collected, six quail eggs wrapped in silver wire to show that although my six children have flown the nest, they are still bound to me by our heart strings. The stack of paper was made from plants in my garden. 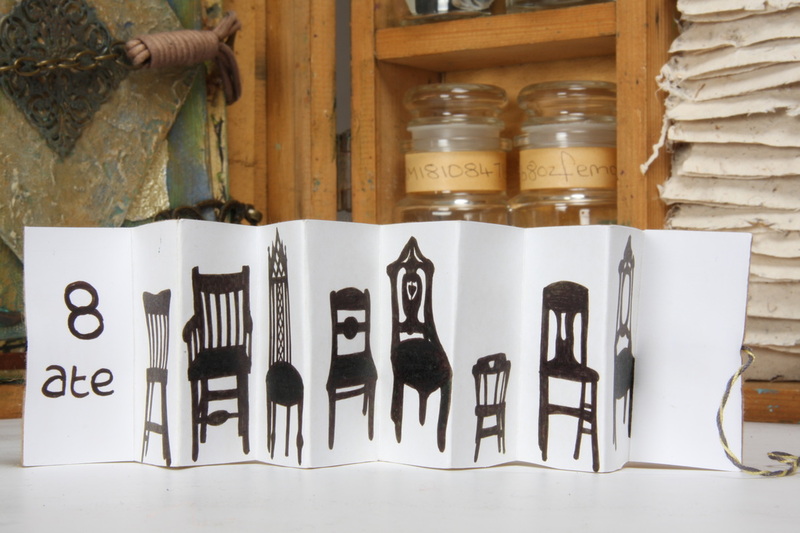 There are also six miniature books, the contents of two are pictured below. On the other side of the box there is a window (to my soul?) inside there are 25 opaque scrolls tied with cotton, the bottom ones hold my deepest regrets, the middle ones are my blessing and the top ones hole my hopes and aspirations - to remove them would destroy them as they are firmly held in place. 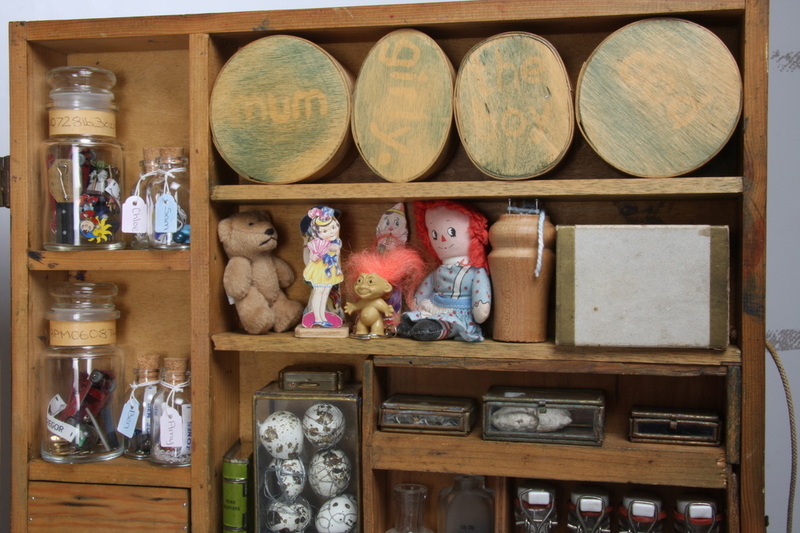 Above detail of the top right corner: showing the four wooden boxes of: 'dad' - 'the boy' - 'girly' and 'mum'. Toy shelf - I was not much more than a child myself when I started my family, my toys became their toys. 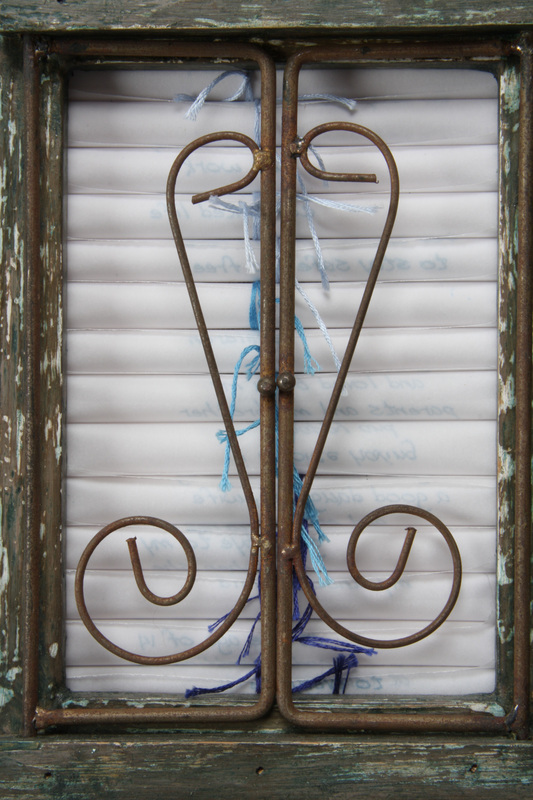 Above detail: The scroll window holds my deepest regrets, my blessings and my hopes and aspirations. 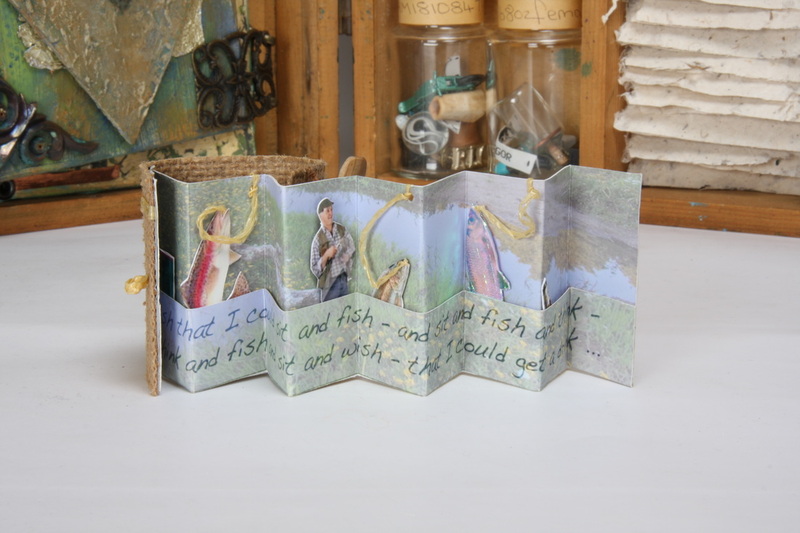 Above: This book holds a little rhyme that my dad had hanging up in his shed when from when he used to go fishing. Above: This book is called '8 Ate' - there were eight chairs at our dining table every day - plus my mum collected homophones. Above: The contents of the 'girly' box - each has it's own special reason for being in my box. Above: The contents of the JRM bottle - see introduction paragraph for further explanations.